This image is a wide angle. We, my dog and I, were about 1½ meters away or about 5 feet. This cat is not afraid. He’s at full attention. You can see it in the eyes and the ears but he has no intention to attack or to flee away. If that was the case, the eyes would be “full saucer” and the ears would be sideways. He’s very sure of himself. In fact, this cat lives just next door but he doesn’t wear any collar. 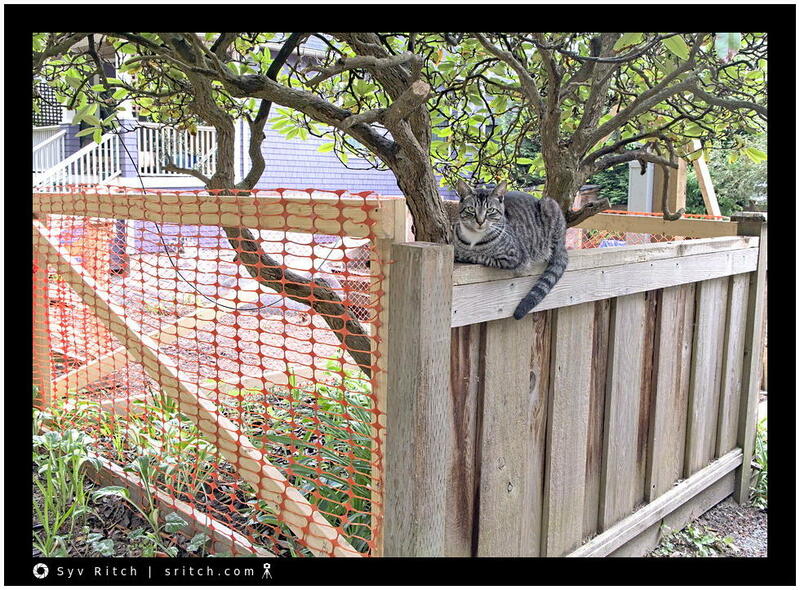 The fencing is to protect the tree during the construction. It’s one of the condition for the building permit issued by the city. Each tree needs to be protected. In the late 1980s, many people came from Hong-Kong to Vancouver because of the fear of the return of Hong-Kong back to China. Somehow, somewhere in the Chinese tradition, it says that trees keep spirits so when they would buy a house, they would cut down the trees. City Hall made the preservation of the trees even on private property and on the city property a condition of the building permits.